That was a failure. First day of chime choir and I got 3 kids at my 7:00 time (one was John and one was his friend, who I picked up and brought) and 2 kids at my 8:00 class. Sadly, there’s not a lot you can do with 2 or 3 kids. I’m supposed to have a beginner group tomorrow, that is just 3 and 4th graders. I have about 6 or 7 signed up, but they will be split, too. If I don’t have at least 20 kids enrolled, there’s not enough money to pay me. I feel like just calling it quits. Who needs to get up and be to school at 7:00 am anyway. It’s like when you throw a party and you’re the only one who comes. A list for back to school time. 1- Loving this rain. Love, Love, Love it! I can open the windows and smell the clean earth. The grass is green and lush and we are saving up valuable water. The sound of the rain is comforting to me. I love when I wake up at night and hear the rain. Plus it cools things off, and we definitely need that in August. 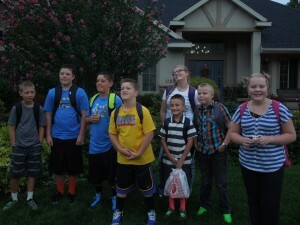 2- School starting. Ugh. 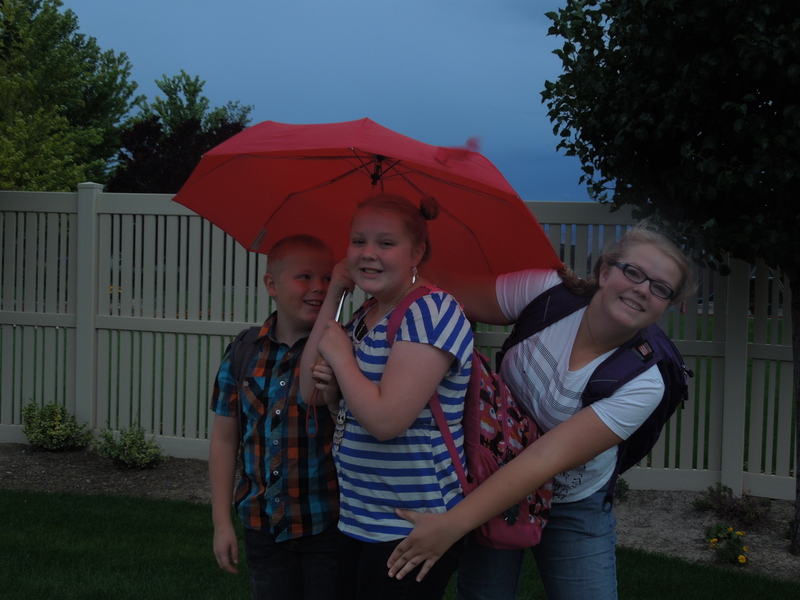 The three kids at home started school yesterday. No one came home in tears, and they generally had good things to say about school, so I guess it was good. I think we have our carpools in place to get them where they need to be. Three different schools. I start my chime choir next week. 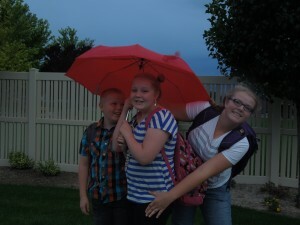 3-Megan starts school at Snow college today. 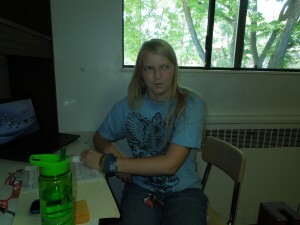 We took her down to the small town of Ephraim on Saturday, and helped her move her stuff into her dorm room. She didn’t really want us to hang around and buy groceries or help her get organized, so we let her do that. Hopefully she actually bought some groceries and has something to eat. I had purchased most of her books for her online, but there were some smaller ones and a clicker that i didn’t get for her, so she was supposed to do that. 4-Flies. How in the world are there so many flies in my house? Argh. 5-Crowing. Two of our cute little chickens are definitely roosters. 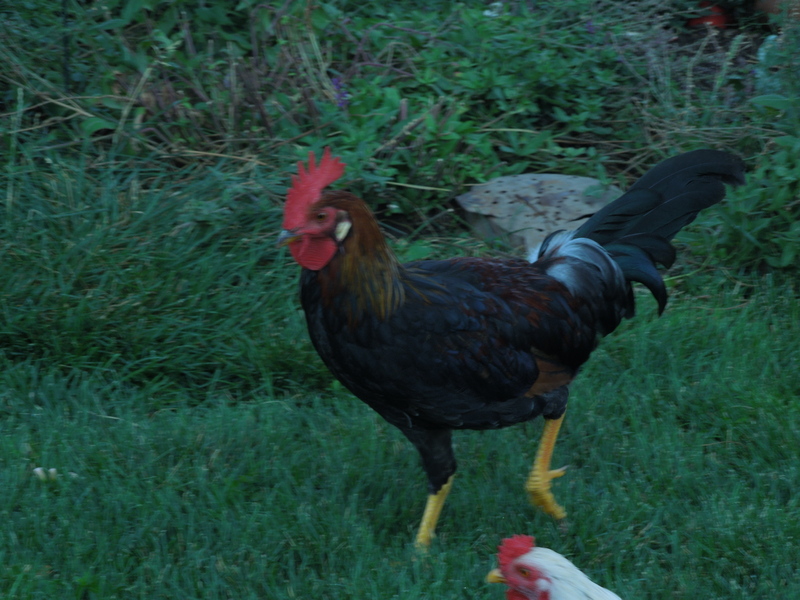 One of them is small and annoying and I wouldn’t miss him at all, but MY chicken is a beautiful rooster. Wondering if I can just get rid of one and then the crowing won’t be so annoying to my neighbors. 6-Construction. I kind of don’t care if I annoy my back neighbors because I’m living with their construction noise and it’s annoying me. So there. But I do care about my other neighbors. 7-Peaches. It’s peach season, so I’ve got a lot of peaches that need to be bottled, eaten, cooked, or frozen. This morning I’m having a peach smoothie. By the way, my daughter says I shouldn’t post this. But I know nobody reads this anyway. It’s just for her to read when she’s my age so she can laugh. Good thing I have a sense of humor, so she’s still alive. Yes, as mothers, we sometimes take the brunt of the criticism, and brutal honesty, from our kids. I got this message yesterday from college daughter, who is not big on thank yous or sentiment. Yeah, if I weren’t already crying after dropping her off at school on Saturday, that would do it. I have been having some headaches and was feeling generally tired and run down, so I made an appointment with the doctor. My old doc died last fall from cancer and I really didn’t want to go see someone else, but I sucked it up and made an appointment with someone else in his practice. Don’t you love explaining all your symptoms and complaints to a stranger? So fun. Anyway, he reassured me that I most likely don’t have a brain tumor or some other degenerative disease, just tension headaches and stress causing the problems. But he agreed to do a blood test to look for weird hormone levels and such, gave me a prescription for a stronger pain killer and also some hormone replacement that might help with all the peri-menopausal stuff. So, on the way home I went to the Walmart pharmacy to pick those up. Sadly, I realized I had taken the health savings credit card out of my wallet in order to pay some bills, and hadn’t put it back. Well, I’m not about to pay for a medical expense out of pocket when I can use the tax free money we’ve put aside for that, so I did some back to school shopping and came home. Later that night I had to take Natalie to a party, and figured I would stop by and get the RX then. I looked in my wallet and couldn’t find that card again. I was SURE I had put it in my wallet. What? This time I did NOT buy any school supplies and just went home. At HOME, I discovered that card in my pocket, where I had put it. See, I’m losing my mind. On Saturday, after the trip to Ephraim, Ryan suggested we stop at Walmart and get John’s pencil sharpener and colored pencils that he needed, and pick up those prescriptions. Of course there was a line at the pharmacy. There’s always a line. I have a friend who is a pharmacist there, and she pulled me up and said, “Paige, do you have a new insurance card, because it’s saying that the one I have on file isn’t valid.” Nope. Same card. Seh looked it up under Ryan’s name and said that for some reason I am not covered under his policy anymore. Um, what? I thought about just paying for it without the insurance (had my credit card this time), but it was $120 for just one rx. I asked about the other one, and she said they only had one. Seems they need pain killer rx to be actually called in, not just sent over electronically. So, I would need to call the doctor’s office AND call the insurance company. When I came back to the car, the family was wondering what in the world had taken so long, so I explained my predicament and laughed. That night, I asked Ryan to log on to his insurance website and print out a new coverage card, which he did. Sure enough, the prescription coverage had a different number. On Monday morning, I called the doctor’s office and explained that I needed them to actually call in that rx. Monday, after taking the kids to DI, we stopped at Walmart….again. I was sure I was armed with all the stuff I needed that that this time, the fourth time, I would get things taken care of. They did indeed have both rxs this time, but when I gave them the newly printed off insurance information, they said THAT wasn’t correct, either. They would have to call the insurance company, if I wouldn’t mind waiting. Of course not. I sent the kids to go and buy milk and bread and gave them some money. Soon they were back and complaining that they were hungry. Well, we have milk and bread….. Not helping. I dug out all the change I had in my wallet and told them to go and buy whatever treat they wanted to with $1.30. Soon they came back with milk duds, and that was a good snack for us all to chew on while we waited. Once they spoke with the insurance company, they put our correct information into their system, so I guess we can only go there for our pharmacy needs. I finally went to consult with my friend, the pharmacist. She explained that this pain killer was a mix of three things, and that it would make me sleepy, so if I couldn’t drive if I took it. What good does that do me, if I can’t drive? Probably won’t be taking THAT. And the headache is pretty much gone, now. The other one was a estrogen thing, but she was concerned that there wasn’t progesterone to balance it, since estrogen alone can cause cancer. What? And this one month supply was $110 WITH insurance. What? No generic, no synthetic? I ended up not getting that one. I guess I’m going to have to ask for something else there. So, after four different trips to Walmart and many hours spent waiting, I came home with one RX that I won’t use. Later, I got a call from the Doctor’s office to tell me the result of the blood test (wonder how much that one is going to cost me?). All my levels looked normal, except my iron was low. I just about cried. I was so hoping that there was something that could FIX me, something that would help me have energy, help with the not sleeping and the crankiness. And you wonder why I don’t go to the doctor very often? I had a crap day yesterday. A certain headstrong child of mine and I got into a huge angry shouting match and I behaved badly. As a mom, I should be more in control of my actions. Then I felt like a horrible failure all day. My older daughter is leaving this weekend for college and she’s anxious and apprehensive about it. We still have much to do. I don’t know how to make it better for her, and I’m feeling the separation anxiety myself. I don’t want to let go. I want her to grow up and have a wonderful college experience, but I don’t want to be left out of her life. I want to know what she’s experiencing, but I know she won’t share much with me. And she’ll be two hours away, which isn’t great for just popping in for a lunch date. As I was feeling sorry for myself and almost in tears while shopping at Costco, I remembered my dear friend had lost her mother that morning. “Buck up,” I told myself, “At least your mom didn’t die today.” True, my mom didn’t die, but the mother of a dear friend died. I spent many many hours in their home and I knew and loved their mom. I hate it that my friends are losing their parents. It reminds me that my parents are no longer young and that death could be a reality. 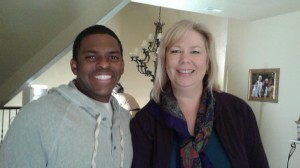 My mom was recently diagnosed with breast cancer. It’s small and they think they got it all with the surgery, but it’s still breast cancer. Later in the afternoon I read that Robin Williams had died, and it looks like he may have taken his own life. Happy, Super Energetic Robin William. The one who made us all laugh. How could he be gone? Monday night was closing night of our awesome play. Tuesday night we had our cast party. 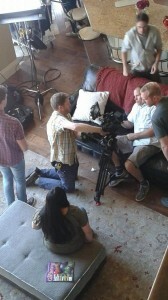 Thursday I got to film an infomercial. At my house. In my bedroom. My friend had given me a couple of these pillows to try for a bit and then asked if I could do a testimonial. By testimonial, that means, the camera crew comes to your house and films you for over an hour talking about how much you LOVE that pillow. Insane amounts of love for that pillow, I tell you. Good thing I have no trouble being overly enthused for something (it’s called acting). The good thing was that she gave me plenty of warning so I could get my bedroom clean. What a mess it was. So that right there, it’s worth it to do the commercial. And I’ll get paid about $50 or so. No pictures of this shoot, sorry. It was really funny when they had me “nap” on my bed with this pillow. They arranged me just right, and then I couldn’t move. Eyes closed, no laughing, no moving while they filmed me sleeping. Eventually, Bronwyn, the production assistant said, “Did someone give you guys your lines?” LINES? We have lines? She wrote down our line, then sent us each to talk to the costumer, who told us which of our clothes we should wear. When they moved the filming to the room where we were, they sent the extras upstairs. Then we could look over the balcony at the set up. They touched up our hair and makeup for us. (These pictures aren’t the greatest. I had my camera, but I didn’t want to look to FAN STALKER ish, so I just used my phone to take pictures. This guy, Stacey, was SO nice. He shook hands with all of us and was talking and asking us questions. He didn’t mind taking a picture or two. We also got to partake of the snacks. I had a bagel and a banana. Didn’t want to seem too greedy or anything. When it was my turn (they called for extra number 9, that’s me) I went down to the kitchen and they placed me and got the lighting right and cameras set up. The theme of the skit is that people want to set up all thier single friends. I say, “he’s really unique looking” while eating a piece of pizza. Then I say, “He’s got that classic farmer look”. They had me do it again and again and say it in a few different ways, taking a bite of cold pizza every time. Hey, I get to film with studio C, I will EAT COLD PIZZA! Yep, five hours for that. When I went back upstairs to get my stuff, someone said, “Did you have to eat the pizza? We should have told you that we NEVER eat the food they give us. We usually spit it out.” Oh, well. I didn’t have anywhere to spit, and I’m not going to complain about the pizza being cold. I could be on TV! No, we don’t get paid to do this. It’s just cool, so I would of course do it for free. It was so fun. I love seeing how things go on, and all the work it takes to make a 5 minute sketch. If I make it past the editing process, I’ll be sure to let you know when and where you can watch it. Even a poor tailor deserves some happiness! What a wonderful experience we had in Fiddler on the Roof. We did that show in High School and I’ve seen it a couple of times since then, but I never really got the depth of the messages of that play. It’s about a family living in trying times, trying to hold on to their faith and their traditions and their way of life while everything around them is changing. Traditional marriage is challenged by three of his daughters, and they eventually lose their home and have to leave and find somewhere else where they can practice their religion in peace. Through it all, Tevye strives to treat others with kindness and compassion, even when he is not being treated fairly himself. Then there were the injuries. I think the count was 7 people injured or out of commission by the end of the show. One guy had to jump into the role of Lazer Wolf at the last minute and do the last 4 shows. He had 24 hours to learn his part. He did a great job, but I’m sure he was praying pretty hard. Backstage he ONLY ran lines. No chatting, eating, or anything else. Great guy. One of the best things about community theater is meeting new friends. I hadn’t done a show at Alpine Community Theater for the past two years, so when we started auditions and I saw so many people I knew, it was like coming home. And I love the new people I met this year. What a great group of people. I hope we actually see each other around and don’t have to wait until the play next year. It was fun doing a show with Natalie again. We were in only one scene together, but it was still nice to have her there. She stepped up and came at the last minute to fill in for someone on one of her off nights. I called her at about 6:30 and told her to get ready, I was sending someone over to pick her up to bring her to do the show. She missed the first scene, but filled in for the rest. She was a trooper. My big complaint about the experience was the heat. The stage is indoors and air conditioned, but the dressing room/green room/ back stage area is OUTSIDE. Yep. 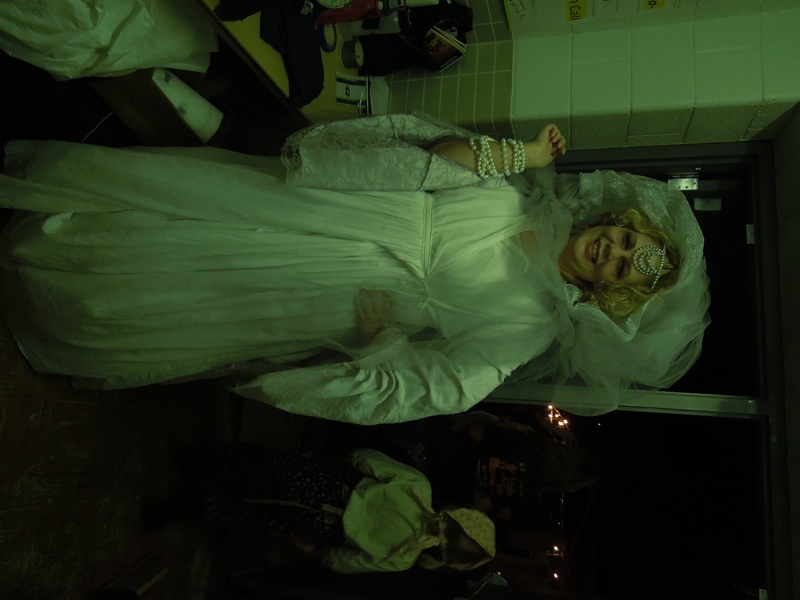 So, on Saturday, when we had to do a matinee, it was torture being outside in the heat in our big costumes and makeup. Then we had to turn around and do another show that night. LONG, exhausting day. I must apologize to my fellow cast members for the things I said in my misery. I just can’t take the heat like that. 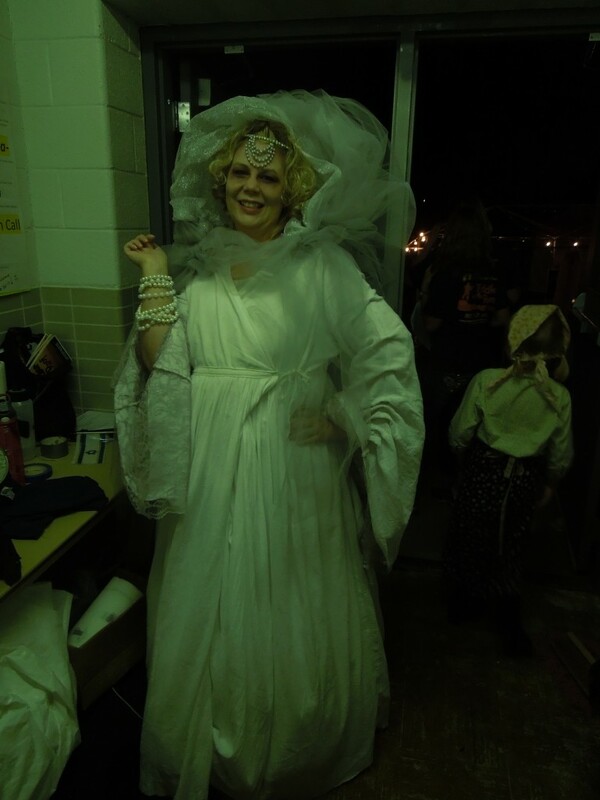 I LOVED playing Fruma Sarah. SO much fun!! 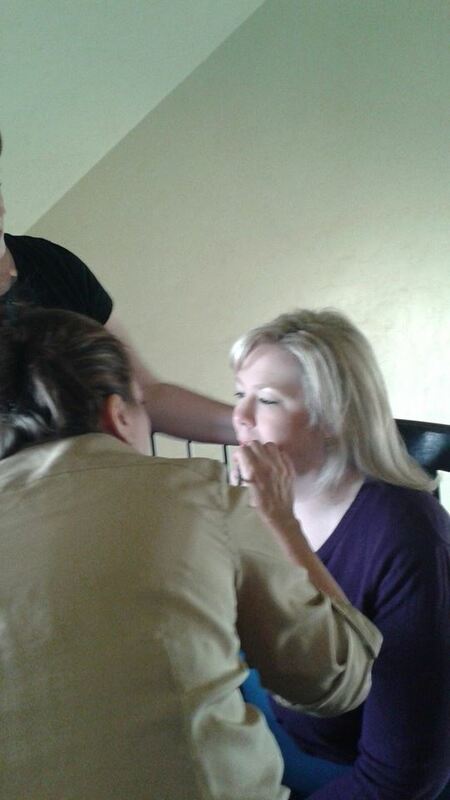 Because of the much makeup and set up involved in that costume, on my Fruma Sarah nights I didn’t get to be in any other scenes, but that’s ok. I got to do all those villager scenes the next night. And my fellow ghost sister wife and I got to be great friends. After auditioning for three other plays and getting rejected, I was kind of feeling like I had no talent at all. But to be able to do this part, this “steal the show” part, it was a great boost to my confidence. Never mind that it’s only one scene, it’s the most fun scene of the show, and I LOVED it! The director never really told me how to do that part, so I just went full out crazy with it, and had so much fun. I figured if she didnt’ like what I was doing, she would tell me to do it differently, right? The show ended on Monday, and we had a cast party on Tuesday. It was a little bit of a let down, but we’ll get over it. Be thankful that it happened, not sad that it’s over.